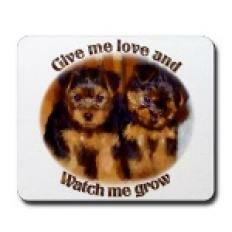 We know from our Yorkie history, that early records were not kept on the foundation breeding stock. I seriously doubt that back in the days where spaying and neutering was not done, that the farmers and working class families didn't have the "occasional" unplanned pregnancy in their canines. If anything, it happened more then, than it does today. It's documented in some of the earliest records that the foundation stock of our breed was cross-bred dogs and dogs without pedigrees (whose heritage is unknown). Even if these dogs didn't look parti, chocolate or golden colored they could very well have harbored the recessive genes in their DNA makeup. Whether their mother/father, grandmother/grandfather or great grandmother/great grandfather was parti, chocolate or golden colored, no one would really know, since record keeping at that time in history, was little to none. More Important Information about your new Yorkie Puppie. Food must be available for small breed and teacup puppies at all times! They should be eating 5 to 6 times a day. Figure on an average every 3 hrs!! This is very important to prevent hypoglycemia! You need to be watching that your puppy is eating frequently throughout the day and even in the middle of the night. These little ones are small and have small tummies and cannot eat a lot at one time so consequently they eat often. Let them. Give new water and food in the morning and fresh again around 4 or 5 PM so they will have fresh food and water throughout the night. Do NOT feed only 3 times daily, that is a disaster waiting to happen. It is your responsibility to see that your puppy is eating well. The danger with small breeds with this method is obvious. Therefore I suggest that if he does not eat, give him some Dyne or honey to hold him until his next meal. He should have his Honey Nut Cheerios snack no later than 2 hours before bedtime with water. Then right at bedtime, more Cheerios without water, Dyne or other sugar replacement. Then he should be placed in the crate for the night but no longer than 8 hours. First thing in the morning, he goes outside and then has breakfast and water. He should have to "go" a half hour to one hour after each meal. We do not cover hypoglycemia for any reason, no one does. It is preventable by making sure your puppy is eating frequently. If you have a pool or spa, please either keep it covered or get a child gate. So many Yorkies die each year in pool accidents. They can get in the pool but are so short legged they cannot get out. Please remember that a Yorkie puppy does not understand the danger of this situation; please protect them with child gates. This is a must. Get a child's playpen and training crate. Little puppies must have their nap times. If you have young children you must supervise your children when holding or playing with little Yorkie Puppies. Teach them the proper way of holding your new puppy and sit on the floor so they don't drop your new little puppy. Childproof your house. Unplug electrical cords; keep wires from TV's and stereos out of their reach. Macadamia Nuts are bad for dogs, don't give them nuts. Chocolate is bad for dogs and puppies. Don't give them Chocolate. 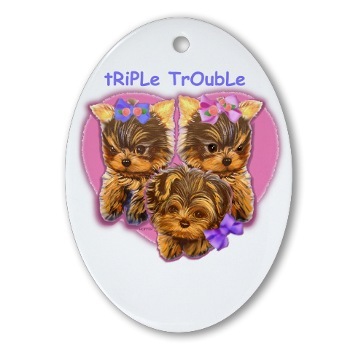 Don't use collars on these little breeds, many Yorkies die at age 6 or 7 due to collars while walking them on leashes. They get collapsed tracheas. Be kind and use a body harness or harness dress or vest instead. Keep your puppy away from other dogs and puppies until they have had their first Rabies Vaccine. That means no doggie parks, no doggie beaches, and no multi dog training classes until the Rabies Vaccine has been administered. Puppies can pick up all kinds of things from other dogs and you don't know where those other dogs or puppies may have been or what they may have and carry and could pass on to your new puppy. Be protective of them and they will reward you with years of love and protection in return. NO LYME VACCINES, this vaccine has killed even large breed dogs. It is not necessary. Use Frontline Plus as a preventative for fleas and ticks. Use Heartguard to protect against Heartworms which come from being bitten by mosquitos. Terriers from the 1860 Book of Field Sports by Henry Downes Miles, is Illustrated by DJ Watkins-Pitchford, are pictured running freely together. The Skye Terrier, The Scotch Terrier, The English Smooth Terrier, The Crossed Scotch Terrier, The Dandie Dinmont and The Bull Terrier. 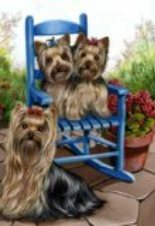 It would be very likely that the parti gene (and other genes for color) remaid hidden in some of our yorkies over many, many generations. This gene has gone unnoticed for so many years because two dogs bred together have to carry the gene in order for the color to be produced. Each dog who carriers the recessive gene and breeds on, passes his recessive gene onto 50% of his offspring. The definition of Parti -is per AKC- Parti-color Two or more definite, well-broken colors, one of which must be white. For example, Black Parti-color would be black and white. 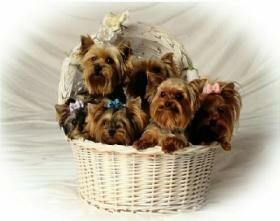 If you hear the term Parti Yorkie, they are talking about the color of the Yorkie. 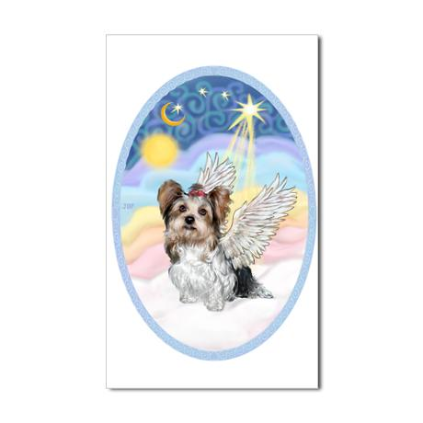 The Parti Yorkie is not a separate breed, it is a Yorkshire terrier. The Parti stuck in front of the name to describe its color. AKC registers them only as a Yorkshire terrier and the color on the papers will say for example (black/blue, white and tan/gold Parti color) where the regular Yorkies colors are black/blue and tan/gold. No white. 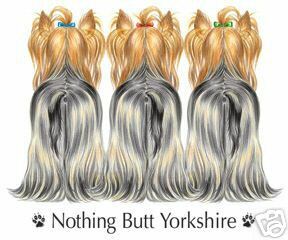 The Nikkos line is the line of Parti color Yorkies most people are familiar with here in the USA. Nikko's Rolls Royce Corniche was a top show contender in 1983 and 1984; he was out of Nikkos Orange Blossom and CH. Nikko's Mister Independence. From Corniche came Nikkos Rolls Royce, Ashley, (Born 6/19/1982) From Ashley, Came Nikko's Mickey Spillane ( Parti colored) ( Born 5/3/1992) and Nikko's Silk and Sale (Born 9/9/1991) When these 2 were bred together my records show that 3 puppies were born on 10/15/1997. These pups were Nikko's Great Expectations (PartiColor) Nikkos April in Paris (Parti-color) and Nikko's Golden Charm II (Black and tan w/white Markings). Nikko's Mickey Spillane was a Parti, but as I said, his AKC papers state blue and tan because AKC did not acknowledge the Parti color at that time. Crownridge and Summit had obtained Parti colored puppies from Nikkos kennels and wanted them AKC registered with their true Parti-colors. 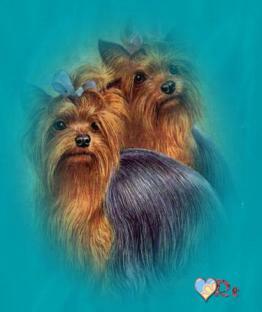 So in 1999 they convinced Nikkos Kennel to go to AKC and get them registered as Yorkshire terriers Parti color. This turned out to be a very lengthy and costly process to Mrs. Lipman, (Nikkos Kennels) as AKC shut down her kennel in 1999 for 18 months to conduct DNA studies of 42 litter's sires and dams. She was not allowed to breed or sell or conduct any business during this time. AKC went back as far as they could with the living dogs. They did DNA'on about 42 litters. They also talked to a lot of the "old" breeders and they told them they had always been in the lines but were disposed of. In June of 2000, the DNA studies of Nikkos Kennel were completed to the satisfaction of AKC. On December 10, 1976 Joan Gordon and Janet Bennett/ Wildweir Kennels had a Tri colored Yorkie born, at that time they had heard of Tris being born in England but had never seen one. They AKC registered the pup and named him Wildweirs Triplicate"Trippy" after his tri colors. He came from a long line of Wildweir Champions and they were indeed shocked to see that the tri could actually be produced from 2 standard colored Yorkies with no history of tri colors in the background. Joan stated they had heard of the tri colors in England but Trippy was the first they had ever seen in person. Trippy was around 5 lbs. and was all Yorkie in temperament. They kept him until he was 2 yrs. old and then placed him with friends where he lived to 12 yrs. old. "It is not unusual to find small white marks on one or more toes or a fine white line in the lower fore jaw. These will not be visible as an adult. A large amount of white marks on the chest, paws, jaws, or skull, places a Yorkie into a tri-color classification and it is very wise to guard against this possibility. Yorkshire terrier puppies can be born of colors that automatically deprive them of the necessary qualities to become the proper colors of the breed. They can be born all black: all tan: tan with black points; tri-color: black, white, and tan; all blue; bluish grey with tan points; and so remain or change to another shade of their newly born colors. These mismarked Yorkie puppies are not the result of the miss-alliances or throwbacks but are rather the net product of incorrectly inherited genes which have failed to activate the pigment glandular system to providing what they require to be in accord with the Yorkshire terrier standard. Puppies incorrectly colored or marked should not be sold as rare; they should not be registered as Yorkshire terriers, but should simply be found a loving home. The breed most connected to the Yorkshire is the Broken-Haired Scotch, which had distinct black, white and tan coloring. Local hooligan dogs like the Black and Tan English terrier, dodgy-looking Maltese imports, and the Waterside Terrier (a small, long haired little ratter) were also chucked into the meld. In 1904, Mrs. Leslie Williams published the book, (A Manual of Toy Dog How to Breed, Rear and Feed Them). In the book she writes "A Yorkie must have the nourishment of meat. Withal, it is a merry little soul and if its coat can be to some extent sacrificed, a good companion, fond of outdoor life, very barky and lively and tolerably affectionate: but a really lovely show Yorkie is not a being for every day. The breed does not suffer much from "distemper" and strange to say in spite of generations of coddling and fussing, and breeding for smallness and coat is a decidedly healthy one. The white Yorkshires a new variety some folk have tried to push is, I think in no way especially desirable. The Maltese can do all that is necessary in that line while the attempt to make silver Yorkshires popular, too, simply means that the bad colored dogs without any tan (paleness of tan is the stumbling-block in many Yorkshire's career) are classed by themselves and offered prizes." Hemingway's Grandfather Ernest (Abba) Hall owned a white Yorkshire Terrier Named Tassel in the 1900s. As you can see our ancestors were "Tutti Frutti" which makes our breeding more complicated. Nevertheless, considering all the odds, we have succeeded in most of the elements of type. All we have to do to reassure our success just take a pick of pictures of Yorkies appearing in books and magazines from the last century, it would seem - to our reality now that many were just pets. No one knows better than you that as much we have progressed, we cannot get complacent still the hill that we must climb is too steep. These four disorders are somewhat common in the Yorkie breed and can seriously affect the health of your pet and may require medical or surgical intervention. The knee cap (patella) normally fits into a groove in the thigh bone (femur). The patella slides up and down in this groove as the leg bends and straightens. Patellar luxation means that the knee cap has slipped out of the groove. There are several reasons why this happens, including malformation of the groove. Luxation may happen only occasionally, or may happen continuously. The knee cap may pop back into the groove on its own, or your veterinarian may need to push it back into place. Your yorkie will be lame when the patella is out of place. Over time your yorkshire terrier may develop other degenerative joint changes, such as osteoarthritis. View complete article on patellar luxation. In a yorkie with a portosystemic shunt (PSS) there is abnormal blood flow in the liver. Blood should flow from the digestive tract to the liver via the portal system into the blood vessels of the liver, and then to the caudal vena cava which is the large blood vessel carrying blood back to the heart. In a portosystemic shunt, as the name implies, portal blood by-passes the liver and goes directly to the systemic venous circulation (caudal vena cava). One important function of the liver is to clear toxins, many of which are by-products of protein digestion, from the blood. In PSS, these toxins are not cleared, and circulate in the body. This causes the clinical signs associated with PSS, many of which are neurological. The complex of neurological and behavioural signs caused by liver dysfunction is called hepatic encephalopathy. Portosystemic shunts may be acquired secondary to another disease, or they may be congenital - that is the yorkshire terrier is born with a shunt. A congenital shunt usually occurs as a single abnormal blood vessel that is a remnant of normal embryonic development. These shunts are defined as intra-hepatic or extra-hepatic depending on the location of the blood vessel in relation to the liver. Most yorkshire terriers with congenital portosystemic shunts show clinical signs before 6 months of age. Where signs are subtle, the condition may not be diagnosed until much later. View complete article on portosystemic shunt (liver shunt). The normal retina lines the back of the eye. The retinal cells receive light stimuli from the external environment and transmit the information to the brain where it is interpreted to become vision. In retinal dysplasia, there is abnormal development of the retina, present at birth. The disorder can be inherited, or it can be acquired as a result of a viral infection or some other event before the yorkie pups were born. The geographic and detached forms cause some degree of visual impairment, or blindness. View complete article on retinal dysplasis. Tracheal collapse is a narrowing of the inner diameter of the trachea, that fluctuates with the stage of the respiratory cycle. The rings of the trachea (made of cartilage) lose their ability to maintain their shape, and collapse when the yorkshire terrier breathes, causing a harsh cough. 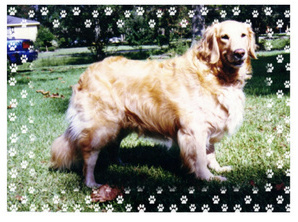 Most often this disorder is seen in middle-aged toy and miniature breeds. Chronic respiratory infection, obesity, and heart disease can all contribute to the development of the condition, but it appears that there is also a congenital deficiency (ie. 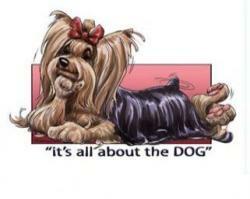 a yorkie is born with it) in the make-up of the trachea itself. View complete article on tracheal collapse. Another health problem that all Yorkie owners need to be aware of is hypoglycemia. Click here to learn more about hypoglycemia health problem with yorkshire terrier.